Have you noticed the trend in the last 15-20 years to give churches unique names? For years Christian churches tended to be named by one of four methods. The first two methods are quite practical. First, it could be simply the location, usually connected to a denomination’s name. A church is named for its town name, or street name. For example, in a town near us there is Leola United Methodist Church. The second common method was the timing of when the church was started relative to other churches, usually of the same denomination, in the same area. You see this mostly in larger towns or cities. In Philadelphia, one of the most famous churches is Tenth Presbyterian. That means there were nine other Presbyterian churches before it. I can see the original members of the church thinking, “We have Grace Presbyterian, Westminster, Trinity, Philadelphia…they’ve already taken all the names! There are nine others! What should we call ours?” Someone says, “How about Tenth?” And it stuck. That’s true! Then the next two methods are distinctly Christian. A church could be named for a famous Christian, usually titled a Saint. Some of our sister EC Churches are named for saints. St. Matthew’s EC Church is in Emmaus, PA.
Fourth, churches used to be named with a word related to a significant Christian concept: Grace, Faith, Trinity, Christ, Bible. In Lancaster county, we have three different Trinity EC Churches. One in Lititz, Manheim and the city. And that is how Faith Church got its name. But in recent years, groups starting new churches became more…creative. Have you ever heard of the Babylon Bee? It is a Christian publishing company that releases satire, trying to help us laugh at ourselves and our idiosyncrasies. Let me read a few lines from an article they published about this trend in creative church naming. Again, this is satire, meaning that it is not true, and is meant to be funny. So you’re allowed to laugh! CHARLOTTE, NC—A representative for the Ekklesia Church Planting Network confirmed Monday that church planting teams from around the nation are running dangerously low on edgy names for new churches. “We’ve really started scraping the bottom of the barrel,” the representative noted. If we had more time, we could experiment with the Babylon Bee’s Church Name Generator, where, with the push of a button they create church names for you! Try it, it’s amazing. My point is that churches have been experimenting for centuries, using all kinds of names to describe what they are about! 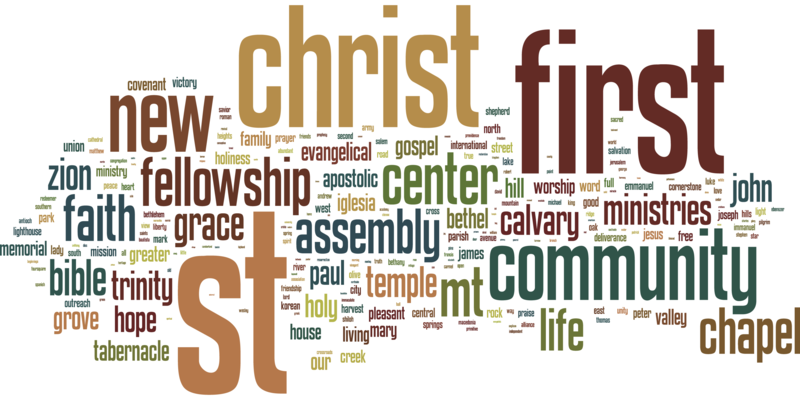 How should we describe a church? A few weeks ago, I said that “family” is a good word, because Peter taught that we should love one another. But it seems like Peter himself maybe wasn’t totally sure how to describe a church. In our next section of 1st Peter, 2:4-10, he uses a whole bunch of ways to describe the church. And some of them are…unexpected. Check back in tomorrow to find out what they are!